As the eagerly anticipated summer season fast approaches Austin "PayDay" Green founder of PayDay Music Group is flying high off the success of his recently released project entitled the "BillBoard Riddim " which features an exclusive lineup of music from Alliance superstar Mavado alongside newcomers Iyara, Flawless, Nymron, Krushal and Conflict. According to PayDay the name of his new riddim is highly symbolic of where he hopes his productions will achieve. "The name BillBoard really speaks to where I want the music to reach "The U.S and world BillBoard Charts". I feel the music in Jamaica needs more financial investment in order to grow so from now on all my Riddim will have underline meanings, I coming next with a riddim called "Mainstream" and then the "Grammy" so when people hear the name in the international market and relate to it". The riddim which was composed by Weed Seed from the Breaton Connection camp is by far experiencing power play on radio airwaves across the world and even in Canadian where International rapper J Diggz is already feeling the positive effects from the Remix he did for Mavado's "Gyal Dem Love Mi Daily " record. "This BillBoard Riddim inspired me to record something smooth with a little bit of controversy for people to talk about stated Nymron, While Iyara who is also featured on the riddim stated "it have a real Billboard vibe to it, cause already it put my career to a different level. It make some real people in the industry start respect Iyara, I've been getting alot of calls and alot of positive feedback overall". 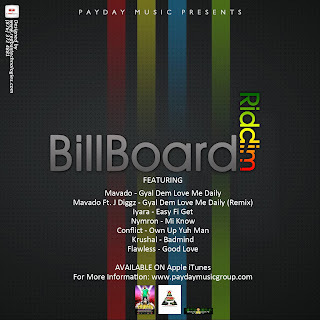 With every hot riddim comes the problem of unsanctioned recordings which has already begun to surface on the BillBoard Riddim but according to PayDay that practice will not hamper his promotional efforts. "Well I started recording artists on the BillBoard in April and the strategy was to keep the project exclusive with only a handful of artists by not crowding or confusing people with 10 - 15 other songs, so when I log on to the internet and see people voicing on my riddim without my knowledge it really upsets me but we sticking to the plans we have and I want people to know these are the only songs I've approved with the exception of a possible late entry from the general Bounty Killer". With plans of shooting a video also in the pipeline PayDay took the time to mention upcoming projects and thank individual he says has been instrumental in the success of his productions thus far. "What next for PayDay is the "Style Dem Riddim" which we are currently mixing at the "Money House Studios" and also the "Victory" & "Mainstream Riddim". Other projects coming up include songs with Bounty Killer, Mavado, Bling Dawg and Lutan Fyah. There is no way I could have done all this by myself so I have to big up all radio DJ's, ZJ's, Sound Selectors and CD Vendors worldwide, Big up Daseca, Kris David and Dutty Coolie who are now official beat makers of PayDay Music, man like Hesh (J Diggz Management and the whole Canadian Family), Specs the Boss and of course Johnny Wonder for the strength. My deepest and sincere condolence goes out to the families of those who lost loved ones in Tivoli Gardens".